We've made frozen chocolate banana treats before, but Big Brother wasn't very interested. However, I thought we'd try them again and guess what?! He loved them! 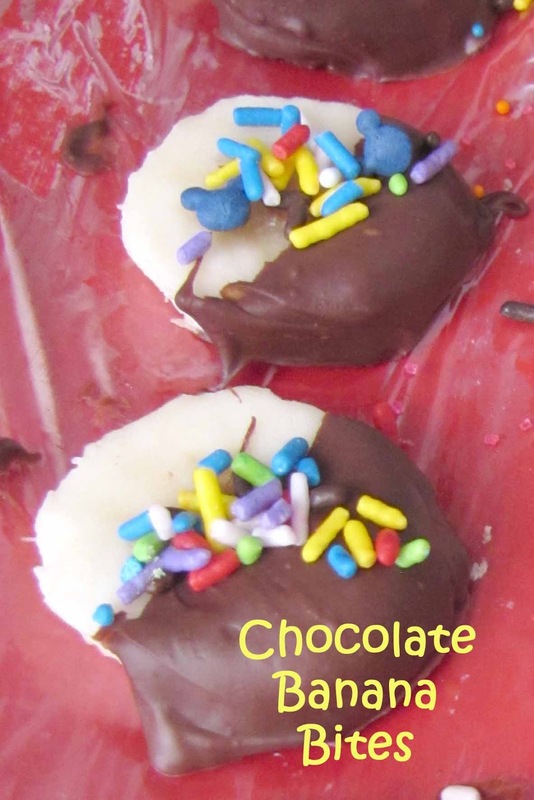 Perhaps the sprinkles enticed him a bit more ; ) Here is a simple yet yummy treat for the kiddos.... or you! All you need is a banana, chocolate, and sprinkles! Big Brother helped slice the banana and then we placed the plate in the freezer for a while; I am not sure how long, but soon enough I heard him calling, "Okay, they are ready. Let's go!" Next I melted a handful (or more) of chocolate chips in the microwave. I dipped the slices into the chocolate and you can guess by the picture below who was in charge of the sprinkles : ) It wasn't me! You have to work fast though and put the sprinkles on right away. The chocolate hardens fast! Finally, eat away! They were literally gone in 5 minutes!